President Obama has expelled 35 Russian intelligence operatives and sanctioned five Russian entities and four individuals for an alleged cyberassault on Democratic political organizations during the 2016 presidential campaign, the White House announced today. "I have ordered a number of actions in response to the Russian government's aggressive harassment of U.S. officials and cyber-operations aimed at the U.S. election," Obama wrote in a statement. "These actions follow repeated private and public warnings that we have issued to the Russian government and are a necessary and appropriate response to efforts to harm U.S. interests in violation of established international norms of behavior." He said all Americans "should be alarmed by Russia's actions," which were designed to "interfere with the U.S. election process." "These data theft and disclosure activities could only have been directed by the highest levels of the Russian government," Obama said. "Moreover, our diplomats have experienced an unacceptable level of harassment in Moscow by Russian security services and police over the last year. Such activities have consequences." Kremlin spokesman Dimitry Peskov said the sanctions are intended to "spoil" U.S. relations with Russia and "undermine" the incoming Trump administration, according to Russian news agency Interfax. Obama issued an executive order, amending his April 2015 decree to expand authorization for a response to certain cyberactivity that seeks to interfere with or undermine U.S. election processes and institutions. Obama said that the State Department is also shutting down two Russian compounds, in Maryland and New York, used by Russian personnel for intelligence-related purposes, and has ordered 35 Russian intelligence operatives to leave the U.S. within 72 hours. State Department deputy spokesman Mark Toner wrote in a statement, "The Russian government has impeded our diplomatic operations by, among other actions: forcing the closure of 28 American corners which hosted cultural programs and English-language teaching; blocking our efforts to begin the construction of a new, safer facility for our consulate general in St. Petersburg; and rejecting requests to improve perimeter security at the current, outdated facility in St. Petersburg." "Today's actions send a clear message that such behavior is unacceptable and will have consequences," he added. House Speaker Paul Ryan supported the new sanctions, saying in a statement that "Russia does not share America's interests. In fact, it has consistently sought to undermine them, sowing dangerous instability around the world. While today's action by the administration is overdue, it is an appropriate way to end eight years of failed policy with Russia. And it serves as a prime example of this administration's ineffective foreign policy that has left America weaker in the eyes of the world." The Democratic National Committee, which was targeted by the attacks, applauded the president for taking action, but said that he didn't go far enough. "These intrusions were not just 'hacks.' They were attacks on the United States by a foreign power and should be treated as such. Therefore, today's action alone by the White House is insufficient," the DNC said. "Now it's time for President-elect Trump and the Republican leadership in Congress to put our national security before politics and show the American people that they are serious about protecting our democracy." "These cyber-operations have included spearphishing campaigns targeting government organizations, critical infrastructure entities, think tanks, universities, political organizations and corporations leading to the theft of information," according to a report issued by the DHS and FBI. "In foreign countries, [Russian] actors conducted damaging and/or disruptive cyberattacks, including attacks on critical infrastructure networks. In some cases, [Russian] actors masqueraded as third parties, hiding behind false online personas designed to cause the victim to misattribute the source of the attack." 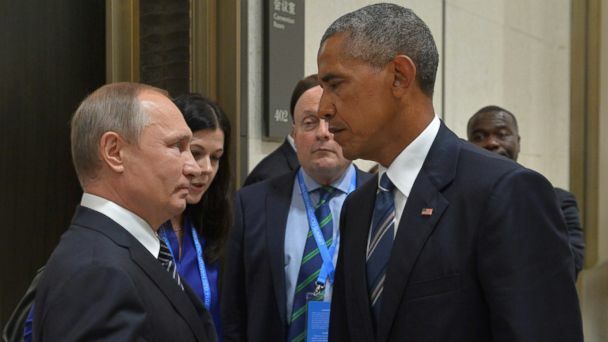 Obama warned that today's actions will not be the full extent of his administration's response to Russia's interference in the election, which some Democrats partly blame for Hillary Clinton's loss to Donald Trump. "We will continue to take a variety of actions at a time and place of our choosing, some of which will not be publicized," Obama promised. "In addition to holding Russia accountable for what it has done, the United States and friends and allies around the world must work together to oppose Russia's efforts to undermine established international norms of behavior and interfere with democratic governance." He pledged that his administration will provide a report to Congress in the coming days about Russia's efforts to interfere in the election, as well as "malicious cyberactivity related to our election cycle in previous elections." The announcement is not the culmination of the broad review of Russian hacking recently ordered by Obama. That review is ongoing, and the government is expected to release its findings before Obama leaves office next month. The timing of today's announcement is notable, with Obama's term coming to a close in 22 days. Trump has questioned the intelligence community's conclusions and has not said he firmly believes that Russia was behind the hacks. In a statement Thursday, Trump said it was "time for our country to move on," but said he would meet with intelligence officials nonetheless. "It's time for our country to move on to bigger and better things," Trump said. "Nevertheless, in the interest of our country and its great people, I will meet with leaders of the intelligence community next week in order to be updated on the facts of this situation."